It’s an old debate, actually –think back to the 1950s, when a burgeoning literature emerged on the employment effect of automation. Or, think about fictitious portrayals such as Kurt Vonnegut’s Player Piano, which provided a dystopian image of a corporate-dominated society in which paid employment was virtually obsolete. More recently, we’ve seen books by such well-known scholars as Stanley Aronowitz, Jeremy Rifkin, Andre Gorz, and Ulrich Beck, among others, all adopting the Cassandra-like cry: Bid Farewell to Work! Now, as discussed in Thomas Edsall’s provocative op-ed piece in today’s New York Times, a new generation of economists (many centered up here in the Boston/Cambridge area) has provided new cause for concern. Two MIT economists — Erik Brynjolfsson and Andrew McAfee—have been tracking structural changes in the economy, documenting some worrisome trends: the ratio of employed people to the working-age population has been declining steadily and precipitously since the 1990s. 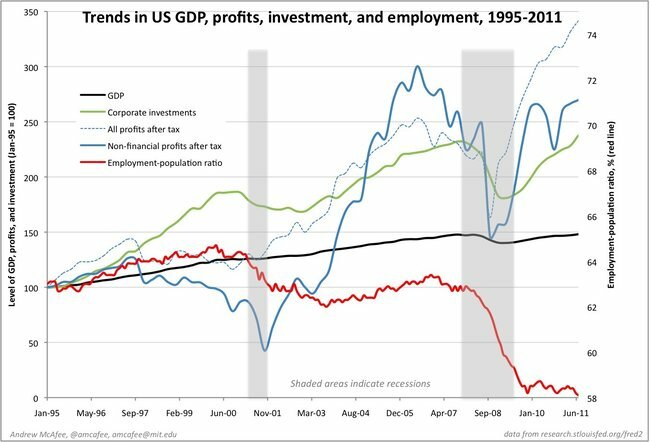 Corporate profits, though they moderated during the great recession, have recovered nicely (this is especially true of financial profits), even as demand for labor has either fallen or stagnated. The image, then, is one of a growing and even buoyant economy whose material benefits are limited to the ranks of the highly affluent – an economy and society, in other words, that can grow without need for people in anything resembling middle class or middle-income jobs. Below is a graphic that documents something of the Brynjolfsson-McAfee analysis (click here for their blog). As you’ll see, the red trend line represents the employment/working age population. The green lines represent different forms of corporate investment and profits. The black line in the middle of the graph shows the trend of GDP. In line with the dystopian narrative outlined above, the data suggest a free-fall in demand for labor, even as the economy has weathered the turbulent downturn. Is this a presentiment of a real structural trend? Were the earlier Cassandras wrong, but only temporarily so? Do the disastrous labor market experiences we hear about college graduating classes show us the future of a middle class in permanent decline? If the answers are all affirmative, then the material stakes are obvious. How shall people find their livelihoods in the near term future? In organizational terms, the question must be raised as to how such structural trends affect the balance of power within the firm (as those who remain employed become ever more aware of their precarious situation). The cultural stakes are more subtle, but equally real. How can a society founded on paid employment –what Ulrich Beck, borrowing from Sebastian de Grazia, has called “the work society”—adjust to a world in which paid employment is available to a smaller and smaller proportion of the population? Questions abound –and answers, like jobs, are in remarkably short supply. This is indeed pretty frightening. I’d be curious to see some sort of wage line, plus some international comparative data. Isn’t it (neoclassical) economic gospel that when wages go down (which, if I’m not mistaken, they did in this period) employment will go up–and also that the US has lower unemployment than its European couterparts in large part because it also has lower (and less regulated) wages? The trends in this chart could potentially problematize that line of thinking. How to deal with the practical consequences and/or aid those most negatively affected is of course another question. The metrics are indeed frightening. Even more so if one considers that separate ethnic/racial and educational groups are and will be differentially exposed to risk. If the prospect of relatively secure employment is removed, how will the social order respond? Or, what will happen to low-skill positions, when the economics of mechanization become more affordable, e.g., grape harvesting? What will be the impact on international migration patterns, or the social order in other societies, as this technology spreads? More thought provoking yet is the continuing trend to ever more sophisticated implementation of “labor saving” devices, e.g., 3-D printers that permit a drastic compression of the design to manufacturing process, or self-help automated phone lines. Or consider the impact of CAD/CAM on the clothing industry.The prospect is that the trend to ever more sophisticated manufacturing and service positions will continue, at the cost of relatively skilled – and well compensated – technician positions. The comment that greater productivity leads to an increase in wealth may be historically accurate, if one thinks in terms of arithmetic means, but as has been frequently noted, the jobs that are becoming obsolete are not qualitatively the same jobs as are those that are being created. Speaking of Kurt Vonnegut, there are other SF authors who could be considered for course materials in this context, e.g. Isaac Asimov and his I, Robot series.